On this great feast day the Church commemorates the happy departure from mortal life of the Blessed Virgin Mary, and Her translation into the kingdom of Her Son, where He crowned Her with immortal glory and enthroned Her above all the other Saints and heavenly spirits. After the triumphant Conqueror of hell and death ascended into heaven, His blessed Mother had remained at Jerusalem, persevering in prayer with the disciples, until She received with them the Holy Ghost. She desired to assist the Church in its beginnings, and Her prayer was granted. It is generally believed that She lived for a good many years, until the age of 72 or 73. This supposition is based on the fact that Saint Dennis the Areopagite, who was converted by Saint Paul in the year 54, visited Her not long afterward, according to his own narration. That account is judged authentic by reliable authorities, among them Saint Thomas Aquinas. Finally She paid voluntarily the debt of fallen human nature to God, although like Adam at his creation, She was entirely innocent and exempt from the penalty of the painful separation of soul and body incurred by death. She might have been transported alive to Heaven, but chose instead to die, as Her Son also had chosen to die. If the death of the Saints is called a sweet sleep, how much more does the Dormition of the Queen of Saints, exempt from all sin, merit that name? It is a traditional belief of the Holy Church that the body of the Blessed Virgin was raised up by God on the third day, and introduced at once into glory by a singular privilege. The Assumption of the Blessed Virgin Mary is the consummation of the other great mysteries by which Her life was supremely admirable; it is Her true birthday and the crowning of all Her incomparable virtues which we admire singly in Her other festivals. 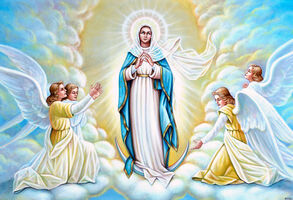 Reflection: While we contemplate in profound sentiments of veneration, astonishment, and praise, the glory to which Mary is raised by Her triumph on this day, we ought, for our own advantage, to consider by what means She arrived at this sublime degree of honor and happiness, that we may walk in Her footsteps as God intends. For Mary is imitable in Her daily life. The same path which conducted Her to glory will lead us there; we shall be sharers of Her reward if we imitate Her virtues. Let us ask ourselves in all situations what She might have done, and act accordingly. Ask, and you shall receive, that your joy may be full.